NEWS - CONTINUED 38 E&MJ • JUNE 2018 www.e-mj.com AUGUST 6-8, 2018: Diggers and Dealers Mining Forum, Kalgoorlie, Western Australia. Contact: Web: http://diggersndealers.com.au. SEPTEMBER 10-14, 2018: Electra Mining Africa, Expo Centre Nasrec, Johannesburg, South Africa. Contact: Web: www.electramining.co.za. SEPTEMBER 20-22, 2018: China Mining 2018, Tianjin Meijiang Con- vention Center, Tianjin, Peoples Republic of China. Contact: Web: www.chinaminingtj.org. DECEMBER 3-7, 2018: American Exploration & Mining Association annual meeting, Spokane, Washington, USA. Contact: Web: www.miningamerica.org. JANUARY 27-30, 2019: 45 th Annual Conference on Explosives and Blast- ing Techniques, Nashville, Tennessee, USA. Contact: Web: www.isee.org. FEBRUARY 24-27, 2019: SME Annual Conference & Expo, Denver, Colorado, USA. Contact: Web: www.smeannualconference.com. MARCH 3-6, 2019: Prospectors & Developers Association of Cana- da's annual conference, Metro Convention Center, Toronto, Canada. Contact: Web: www.pdac.ca. MARCH 10-13, 2019: Haulage & Loading, Hilton El Conquistador Resort, Tucson, Arizona, USA. Contact: Web: www.haulageandloading.com. APRIL 2-4, 2019: MiningWorld Russia, Crocus Expo, Moscow, Russia. Contact: Web: www.miningworld.ru. 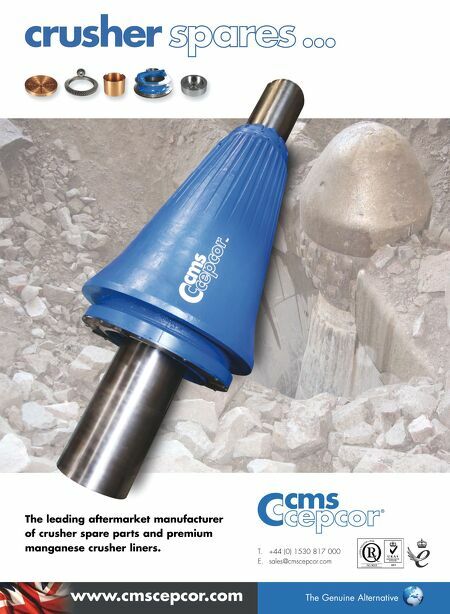 APRIL 8-14, 2019: Bauma, Messe Muenchen, Munich, Germany. Contact: Web: www.bauma.de. MAY 7-9, 2019: Arminera, Centro Costa Salguero, Buenos Aires, Argentina. Contact: Web: www.arminera.com.ar. MAY 10-13, 2019: Longwall USA, Pittsburgh, Pennsylvania, USA. Contact: Web: www.longwallusa.com. NEWS - CALENDAR OF EVENTS Wood Wins Contract to Expand Tasiast Gold Mine in Mauritania Kinross has selected Wood to provide en- gineering, procurement and construction management services to Kinross Gold for the Phase Two expansion of the Tasiast gold mine in Mauritania. The award follows Wood's early involve- ment in the project executing the feasibil- ity study for the Phase Two expansion and reinforces the company's longstanding global leadership in the development of gold mines. The project is expected to increase mill capacity to 30,000 metric tons per day (mt/d) to produce an average of approximately 812,000 ounces per year (oz/y) of gold for the first five years, and is Kinross Gold's second of a planned two-phase expansion. Wood's scope of work includes engi- neering, procurement and construction management for the addition of a new downstream processing plant fed by milled product from the semiautogenous grinding mill installed during the initial expansion. Commercial production for Phase Two is expected in the third quarter of 2020. "Winning this contract is a testament to our extensive international gold exper- tise and ability to work across all phases of a project to support our customers globally," said Bob MacDonald, CEO of Wood's Specialist Technical Solutions business. "We look forward to continuing our growing partnership with Kinross Gold on this important project for Mauritania's mining industry." Over the past three decades, Wood's mining and minerals business has suc- cessfully delivered more than 125 gold projects globally for key customers in the industry. This includes the current EPC contract for the Gruyere gold project, one of the largest undeveloped gold deposits in Australia. In related news, Wood was honored alongside K+S Potash Canada with the Hatch/CIM Mining and Minerals Project Development Safety Award recognizing the outstanding project safety systems, cul- ture and performance achieved during the project execution of K+S Potash Canada's Bethune mine in Saskatchewan. The award was presented at a gala hosted during the annual CIM conference in Vancouver. Lucara Recovers Large Diamond From Karowe Lucara Diamond Corp. recently recovered a 327-carat (ct) white diamond from its Karowe mine in Botswana. A total of eight diamonds greater than 100 ct have now been recov- ered at Karowe since the begin- ning of the year, including the 472-ct diamond announced in early April. "In 2018, mining at Karowe is fo- cused in the high-value south lobe, which consistently delivers large, high-quality diamonds in excess of 10.8 ct," said Eira Thomas, CEO, Lucara. "The 472 ct is the third-largest diamond ever recovered from the mine." The company will hold an exceptional stone tender in June that will include the sale of the 327- and 472-ct diamonds, alongside other qualifying diamonds that have been recovered since the start of the year. Viewings will be held in Gaborone, Botswana, between June 10 and June 19, with the tender scheduled to close on June 19. In February, Lucara acquired Clara, a secure, digital, rough diamond sales platform that combines proprietary ana- lytics with existing cloud and blockchain technologies to modernize the current di- amond supply chain. Commercialization work has since commenced, under a bud- get of approximately US$2 million, and is tracking on schedule for implementation using diamonds from Karowe, beginning in August. 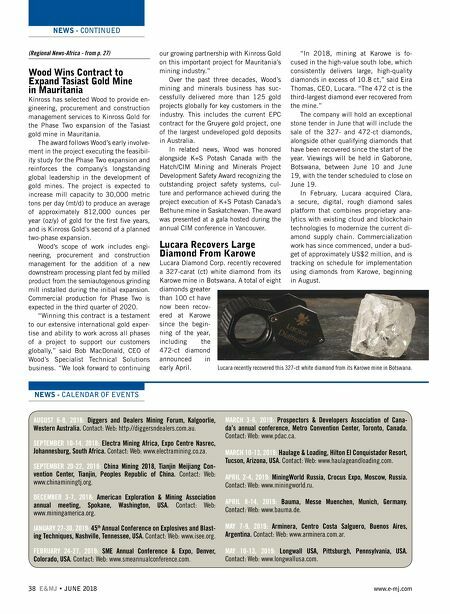 (Regional News-Africa - from p. 27) Lucara recently recovered this 327-ct white diamond from its Karowe mine in Botswana.